These whiskey-inspired bar soaps are inspired by classic cocktails, and come in ready-to-gift tins. It's rumored that the Rusty Nail's name comes from its original method of preparation. The classic cocktail may have been stirred with precisely that. It sounds pretty manly, but not the most hygienic way to mix a drink. Most whiskey drinkers today prefer their booze, and their bodies, a bit cleaner. While we certainly can't advise sipping this luxurious whiskey-inspired soap, we can recommend lathering up with it. If a Rusty Nail's not your poison (Drambuie and Scotch), you can order up a bar inspired by the Manhattan (rye, sweet vermouth, and bitters) or the Rob Roy (Scotch and sweet vermouth). Each bar contains notes of what make the cocktails they're named for memorable—like the honey, herbs, and spices in that rusty nail—so they leave skin smelling fresh, not boozy. 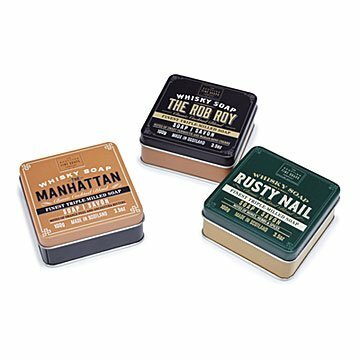 They even come packed in a giftable vintage-inspired tins. Made in Scotland. Gave as a gift, looking for a masculine gift. This also reflected the reciepient's appreciation for scotch.